Motion-Sensing LED Track Lights – Providing light at night, but not too much light. Night lights don’t seem to put out too much light when you test them out during the day, but those little bulbs can seem like a miniature sun when you’re trying to get some shut-eye in a dark room. Two choices – Wake others up by shattering the dark with that bright light or fumble around in the dark. Oh wait. Now there’s a third choice. Motion-Sensing LED Track Lights provide enough light to navigate a dark room while still being dim enough to not disturb others, especially since this lighting system is made to be mounted under a bed, crib, sink, vanity, sideboard, or even inside a closet. 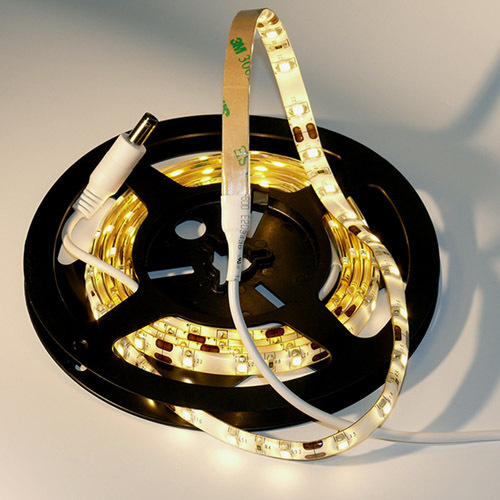 The LEDs, which are mounted on thin strips, are triggered when motion is detected but you get to choose how long they stay on, being able to select anywhere from thirty seconds to ten minutes. The single sensor version and the closet version of the track light system are each available for $79.99. The dual sensor version costs $99.99. Marty Shaw is a freelance writer who currently calls Texas his home. When he’s not trying to figure out a creative way to hitch a ride in the TARDIS, he imagines what it would be like to live through a zombie apocalypse as an uncool version of Daryl Dixon. Marty Shaw – who has written 259 posts on The Red Ferret Journal.